Flying every day this month really got me in the routine of making decisions, and decisions is all flying is about. Especially interesting were the flights during night time. Rabbit lights to the right of the city. 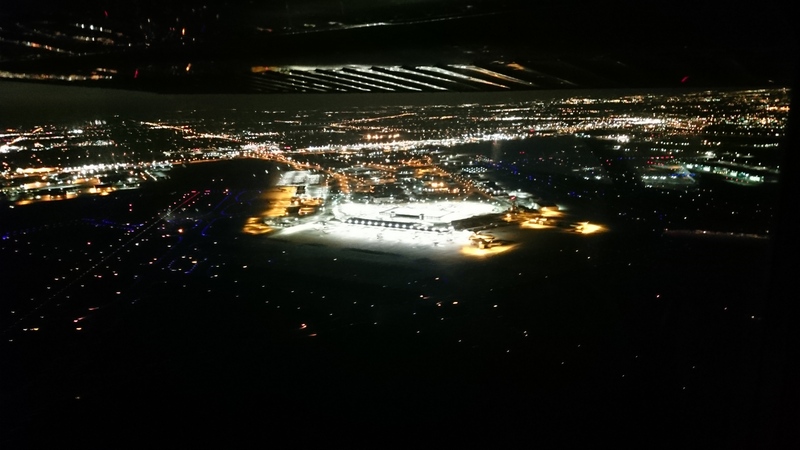 Night flying is so smooth – much smoother than driving a car – that it gives me a very comforting feeling in an environment that seems surreal. However, it is very important to realize that this is real and a plan B should always be handy. One thing that happened to me was a high oil temperature indication. I was on a night VFR flight and I decided to file IFR with a flight service station in the air, just to do it once and to learn how it works. It took maybe ten minutes and after I switched back to the Center frequency I saw the oil temp needle touching the red and the engine felt rough after I saw this – but that might have been highly subjective. I took a deep breath and enriched the mixture, reduced power and reached for the pilot’s operating handbook of the Cessna 172P, but couldn’t find any useful pages. I advised Denver Center of the situation and told them I might land at Burlington (KITR), which was just below the airway I was on, twenty miles ahead. The controller wanted me to descend 2000 feet lower, but I declined and told him I wanted to keep the altitude until overhead the field. The temperature dropped a bit further into the green during the next miles and I decided to continue with a few shortcuts. But that wasn’t so easy either. I usually fly GPS equipped IFR, but this plane only had VOR and ADF. I told the controller I would fly “direct” to an intersection. Instead of just punching it into the GPS, I had to follow a certain NDB bearing to a VOR radial. This rerouting also enabled me to remain close to the alternate airport. 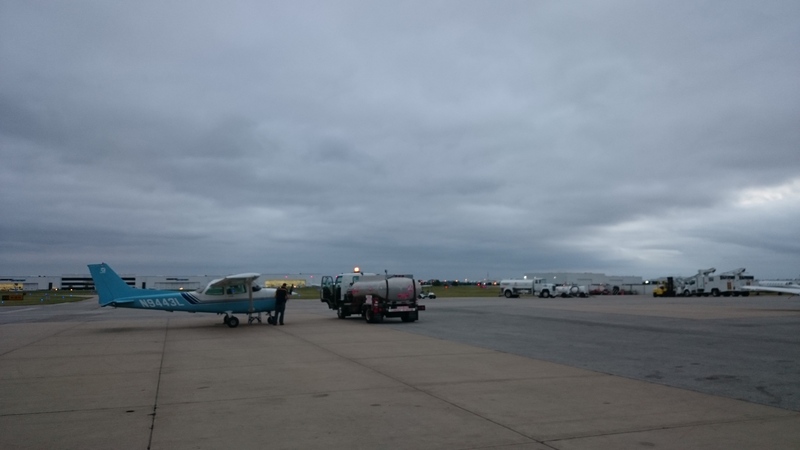 I arrived via a visual approach at Centennial and was puzzled by the oil temp mystery – it was clearly in the green on the way home but still about a third higher than I am used to from the other C172P I am used to fly. This AOPA Flight Training article shed a bit light on it. It looks like I simply leaned too much with too high a power setting. Pilot controlled lighting at an uncontrolled airport I passed along the way. On long cross countries at night I started to always switch to the frequency of small airports to turn on the runway lights. In case something happens I wouldn’t be looking for an airport beacon alone, but for the whole christmas tree. Yesterday I decided to conclude my hour building with a long cross country from Denver to Wichita, KAPA – KICT. The flight to Wichita started off pretty boring. 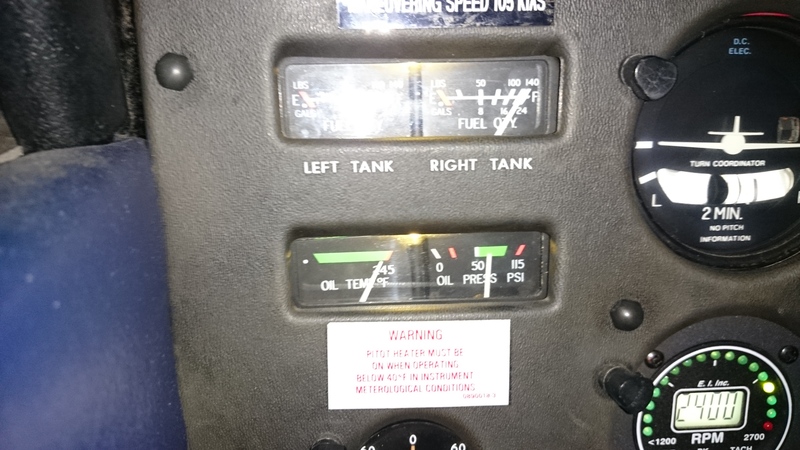 I had a neat flight plan with a standard instrument departure, victor airways and everything was set up in the cockpit in order to be ahead of the airplane. Then, after taking off on runway heading, the controller directed me to fly direct Wichita airport when reaching 8000ft. 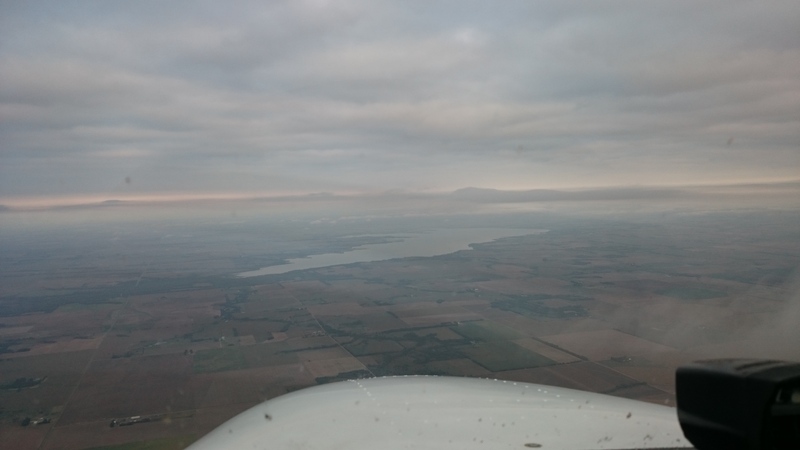 About 350nm of straight and level flight followed. At least the weather had some surprises ready. Kansas was covered by three broken layers. 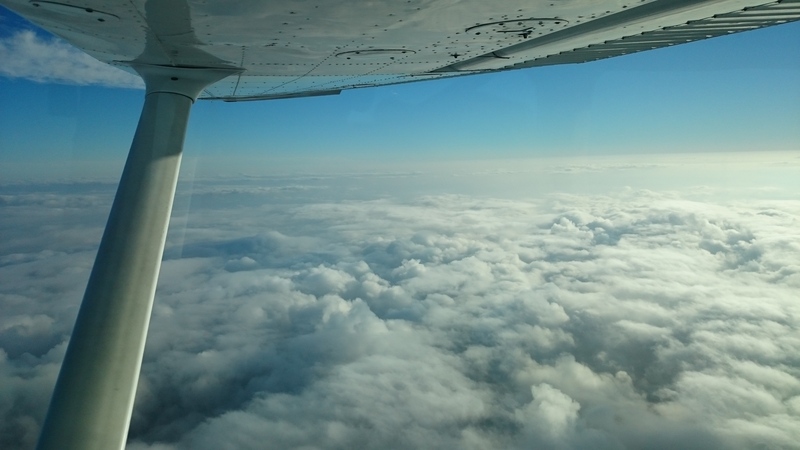 I flew along the bottom of the top layer and enjoyed the view of clouds all around me. Before my descent into the clouds the air was cool and dry, down there it was humid and warm. Wichita approach vectored me below the lowest broken layer until I had the airport on my 3 o’clock for a visual approach to runway 19L. Below the clouds. That’s what an instrument rating is good for! Shortly after my landing the sun had set and after a quick dinner in the arrival terminal I headed out to the plane again. This time I was cleared as filed and the entire flight was exactly as filed. The weather at Wichita was broken at 3200ft agl and scattered above. The night was very dark, the sky obscured by clouds. 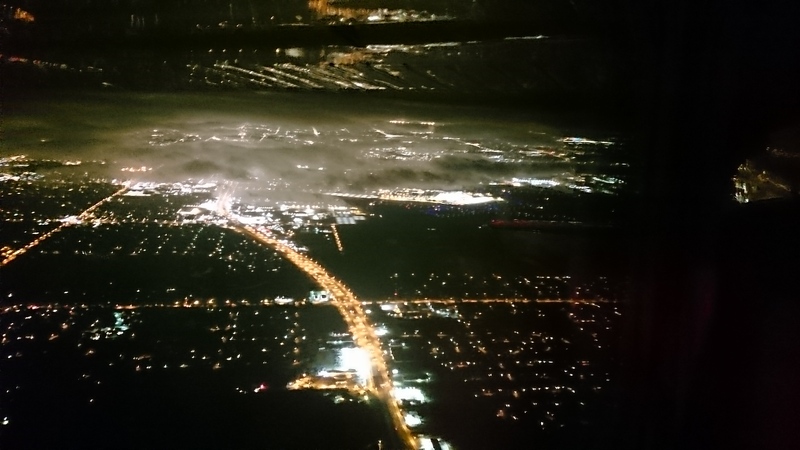 I was excited to fly my first departure at night into IMC, but at the same time was glad to know that the cloud layers weren’t thick, nor would they extend for longer than an hour into my flight. But first of all, I had to get to the runway in a pitch dark night. All the theory knowledge about airport signs finally paid off and I arrived at the holding point of runway 19L. Shortly after takeoff I turned right on course and saw the airline terminals from above, the clouds covered parts of the city. 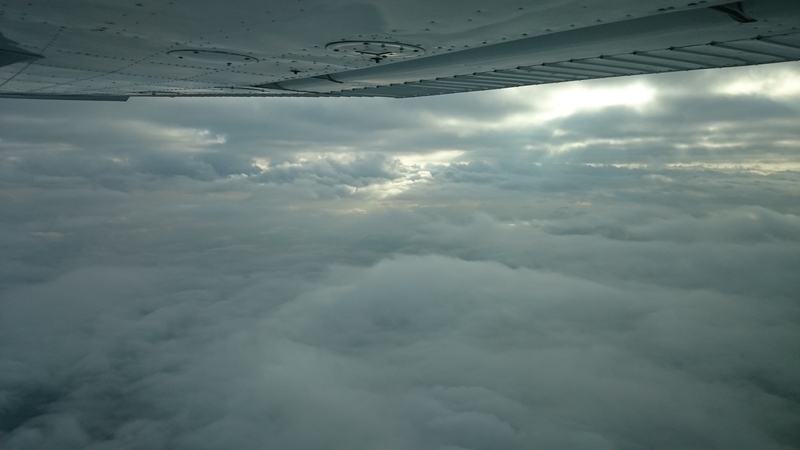 I soon entered a few clouds and found myself in flashes of lightning that illuminated even the cockpit – don’t worry, it was only the clouds’ reflection of my strobe lights, which I turned off to avoid further distraction. Between HUT and GLD VOR the airway is 195nm long. It was amazing to see that the traditional navigation aid actually worked well, even through the middle of the airway where I was 97nm from either station. I had experienced other VORs which would become unreliable after much less than that. Night flying became my favorite type of flying, and not only because I feel badass with my green flashlight around my neck, but because it is just beautiful.